Black Monolith is a fitting name for the latest release on Reverse Alignment. Ajna and Dronny Darko, two well known drone ambient artists, have come together to create a massive double-disc album, which is sure to leave a lasting impression on listeners. Black Monolith presents seven new tracks, along with the massive long-form “1000 Years of Cryosleep”, and tracks from the EP Facing The Void, which had been previously released in 2013-2014 on Petroglyph Music. Dronny Darko should be a well-known name to anyone who has been following the Cryo Chamber label over the last few years. He solidified his presence with his album Outer Tehom, which featured some of the most sinister sounding music in the dark ambient genre. Also of note was his magnificent collaboration with protoU, entitled Earth Songs. Yet even before Outer Tehom he had already been working with Ajna. In 2016, Ajna released his greatest achievement to date, Inevitable Mortality, through Reverse Alignment. Inevitable Mortality showcased a varied spectrum of sounds and styles, true to the versatility of the musician. Tracks like “Forlorn” featured isolationism and black ambient intricacies which could leave the listener in a trance-like state. Realizing the detail and craftsmanship of their previous collaborations, Kristian Widqvist of Reverse Alignment decided to pull together two previous releases of Anja and Dronny Darko, and gave them a proper re-mastering. “1000 Years of Cryosleep” is a slow moving, yet still quite entertaining track, which lends itself to an extraterrestrial sort of sound. The three tracks, “Facing the Void”, “Watching the Lights While Falling Asleep” and “Black Hole Entropy” all taken from the previously released EP, Facing The Void, also seem to reside mostly in this sort of space ambient sound. As for the new tracks, we have a combination of space ambient and something that seems to be more of a sinister terrestrial sound. “Orbiting Probes” carries many of the same features as the previous tracks, adding in a nice touch with the obscured radio transmissions. The albums picks up the pace with “Subterranean Hallucination” a track which bares a nice palette of field recordings. Strange noises present themselves as they are simultaneously blanketed in a dark aura, which feels particularly sinister at some points. “Corrupted Waters” is another example of horrific soundscapes, which feel like they would be the perfect soundtrack to some occult horror film. The title track, “Black Monolith” is another highlight incorporating sounds which would feel right at home on Outer Tehom. The decision to release these three separate albums as one whole, by way of a 2 disc digipak, was certainly a bold one. The two previously released albums benefited from the remastering, courtesy of Chris Sigdell at The Loft. The album art is a fitting visual representation of the sounds presented here, seeming to represent some dark and barren landscape on another planet. As far as the new tracks go, there are some interesting moments, and overall the sound is of a high quality. But, as each of the newer tracks comes in at exactly 8:00, I can’t help but feel that some of what is happening here amounts to filler. In the moments when the field recordings take the lead there are some truly entertaining twists. But the length of both discs combined can lead to a bit of listener fatigue around halfway through the new material. This isn’t to say that all the tracks aren’t good, it just seems that the album is better viewed as two separate entities. Playing just the first or second disc in a sitting can offer the listener a better overall experience with Black Monolith. Black Monolith as a whole is true to its name, dark and monumental. The space ambient sound mixed with a sort of black ambient is a good recipe for Ajna and Dronny Darko, bringing out some of the best qualities in both artists. 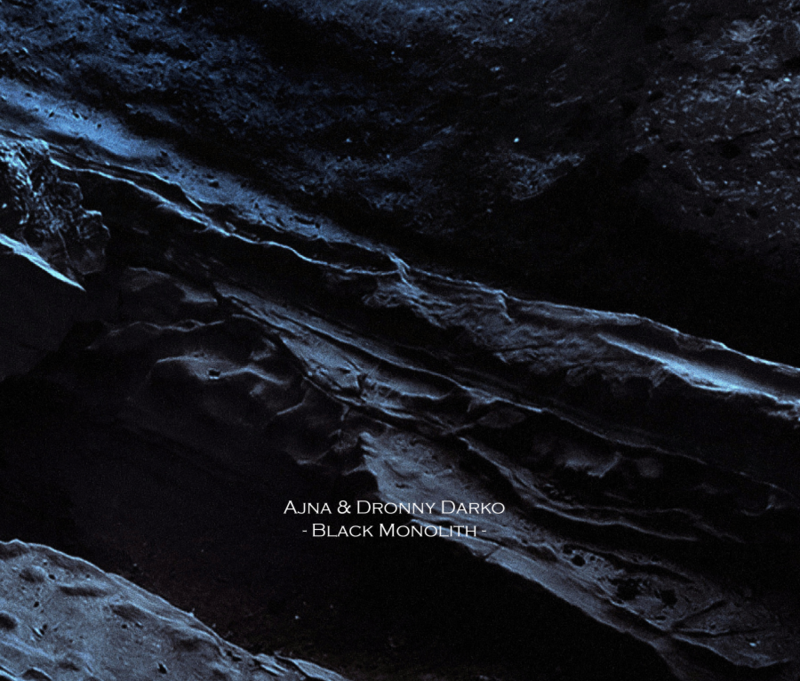 I would recommend Black Monolith to listeners who are already fans of Dronny Darko and Ajna. I fear that choosing this album as a first time experience with the two artists may not do them justice. Yet, for fans of both, there is certainly plenty to love. There is a magic and chemistry between these two artists that shouldn’t be overlooked and future collaborations with one another may still hold the key to some of the best yet from either musician.